The success or failure of planting depends on whether the plants receive adequate moisture. Remember that all plants take months to develop roots and should be watered frequently. Daily watering for 4-6 weeks is recommended to establish such a good root system. Do not rely on the rain to do the work for you. Once the plants are established you can cut back your water to two-three times per week. We recommend checking with your local County Extension Service regarding water restrictions and regulations in your area. Trees and palms need lots of water. After the installation of your tree or palm, these instructions of care and maintenance will ensure proper growth and good health of your new plant. Fill the dirt ring with water, slowly, full to the top, but not breaking the ring. This should be done twice daily for the first four weeks, then once a day for the next four weeks. Then slowly taper off to twice a week for the next six to eight months. REMEMBER: RAIN DOESN'T COUNT AS WATERING! Please water your tree or palm as instructed even if it rains. Newly transplanted trees in Central Florida require 1.5 to 3 gallons of water per inch of trunk diameter per watering. This water must be applied so that it penetrates into the root soil ball. It does no good if it runs around or off this ball. Tree establishment periods for Florida are three months per inch of trunk diameter for most trees. Slower growing trees will take longer, and larger trees will require more time, i.e. a 6 inch diameter tree will require a minimum of 30 months. The amount of care you give your tree will always be directly related to the rate of its growth and its health. The final step in planting is the addition of three to four inches of mulch around the plants. Mulch keeps plants warm in winter and cool during the summer months. It insulates the roots against extremes of temperature, slows down evaporation of moisture from the soil and helps to keep down weeds. 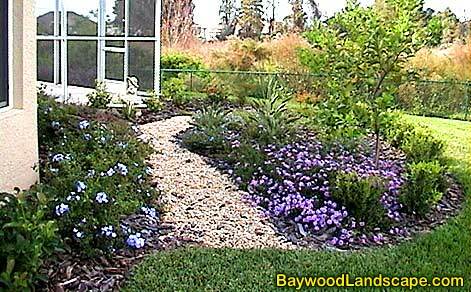 Mulch also provides an attractive appearance to your landscape. After application, wet the mulch thoroughly, then pull it back a few inches from the stem or trunk. This allows adequate air circulation to the base of the plant and prevents rot. All fertilizers contain nutrients that are essential to plant growth and survival. When buying fertilizer read the labels and make your choice based on content and desirability for your particular plants. There are fertilizers made especially for acid-loving plants such as azaleas, gardenias and camelias; bloom boosters for flowering plants; palm tree food and citrus fertilizer. * Fertilize your plants trees and palms three to four times per year between march and November. * Always use a good quality fertilizer and remember you get what you pay for. Liquid Copper and Daconil are good general fungicides. Remember a fungus is usually a round spot on the leaf that burns through. Have fun and happy gardening!! !